How can adults in Early Years settings and primary schools fully embrace the diverse nature of family life of the children they are working with? This essential text will help students and those already working with children to understand both theoretically and practically, what may constitute a `family'. It explores how to build relationships with a child's family to ensure early years settings and schools are working in partnership with children's home environments, thereby supporting the best possible learning outcomes for children. mixed race familiesimmigrant, refugee and asylum seeker familiesstep-families and step-parentinggay and lesbian familiesfamilies and adoptionfostering and children in carefamilies living in povertyfamilies and bereavementfamilies and disability (including mental health). 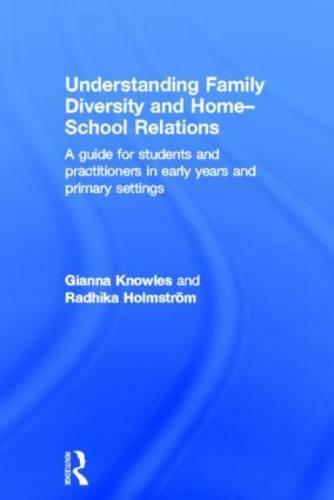 Understanding Family Diversity and Home-School Relations is engagingly practical, using case study examples throughout, and providing reflective activities to help the reader consider how to develop their practice in relation to the insights this book provides. It is a unique road-map to understanding pupils' backgrounds, attitudes and culture and will be essential reading for any student undertaking relevant Foundation and BA Degrees, including those in initial teacher training, taking post-graduate qualifications or as part of a practitioner's professional development.